"A wake-up call for anyone who lives with wildfire risk. Solidly researched, easy to read and reference, and full of information that could save homes...and lives." "...Surviving Wildfire is worthy of the highest recommendation, especially for anyone who lives in or near fire-prone lands; reading it could literally save lives." 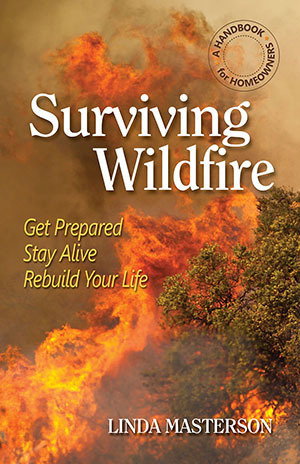 Award-winning author and researcher Linda Masterson tackles a subject she knows all too well in Surviving Wildfire: Get Prepared, Stay Alive, Rebuild Your Life (A Handbook for Homeowners) SurvivingWildfire.com. Masterson's home and 72-acre tree farm burned to the ground in a Colorado wildfire in 2011, leaving her with little but her laptop and a fierce determination to get back on her feet and get on with her life. Masterson has always specialized in turning the complex into the comprehensible. In her job as director of Strategic Planning for Ketchum Communications she provided insight and direction to clients ranging from Procter & Gamble to Campbell Soup. Her book, Living with Bears Handbook, (LivingWithBears.com) is filled with information, inspiration and motivation for people who live and play in bear country. Its combination of solid research, sound advice from bear experts all over the continent and motivating true stories of people and communities who have learned to coexist with bears has made it the book of choice for bear professionals and homeowners alike.